This undeniably enjoyable disc presents live highlights of a concert held in honour of the twenty-fifth anniversary of the songwriters George Stiles and Anthony Drewe at Her Majesty's Theatre on 6 July 2008. 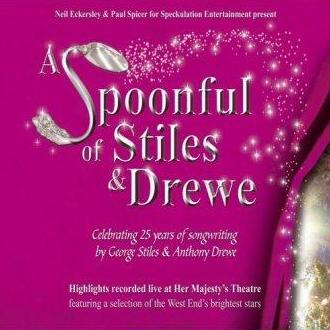 One of the most successful partnerships in recent musical theatre history, Stiles and Drewe are perhaps best known for writing the new songs for the stage version of Mary Poppins, but they also have to their credit numerous other shows including Just So, Peter Pan and Honk! This recording features eighteen of their songs, ranging from the familiar to the completely new. The first half of the programme is a kind of overview of Stiles and Drewes shows to date. It opens with 'Flowers for a King' from Tutankhamun (1984), which is a rather sentimental number but is expressively sung by Helena Blackman (runner-up on the BBC's How Do You Solve a Problem Like Maria? programme). Two comic numbers from Just So (1985) follow, with the slightly silly duet 'There's No Harm in Asking' given a lively rendition by Richard Dempsey and Clive Rowe and Julie Atherton singing the touching, if nondescript, 'Wait a Bit'. An early highlight of the disc is the trio 'Joy of Motherhood' from Honk! (1993), sung by veterans Joanna Riding, Claire Moore and Rebecca Thornhill. The three of them work brilliantly together, harmonising perfectly yet always relaying the words with care, too. 'Never Land' is a jolly song, full of aspiration, from Peter Pan (1996) that unites Blackman with James Gillan. Less successful is 'There's Always Tomorrow' from the same show – the music and lyrics are noticeably less distinctive. Much more fun is a special version of 'Practically Perfect' from Mary Poppins. Three former luminaries of the show, Lisa O'Hare, Scarlett Strallen and Caroline Sheen, all have a go at playing the eponymous nanny, and the results are delightful. The next four songs all come from different sources. First, 'Magic Fingers' from A Private Function (2008), a new show based on the Alan Bennett screenplay that Stiles and Drewe are in the process of writing. The music has an interesting, almost medieval air, its wistfulness brought out to strong effect by Joanna Riding, Claire Moore, Shona Lindsay and Richard Dempsey. The charming 'Carrying a Torch' from The Shakespeare Revue (1994) is sung with heart-on-sleeve sincerity by Riding, while Stiles and Drewe themselves perform the cabaret song 'A Little Bit of Nothing [On A Big White Plate]', a witty little cockney music hall-style piece about nouvelle cuisine. This gives way to another stand-alone piece, 'Diva' from 1996. Alison Jiear revels in the amusing characterisation of the song's desperately inept singer. The final third of the disc is devoted to world premiere recordings from Stiles and Drewe's latest show, Soho Cinders, a contemporary, gay retelling of the Cinderella story. Pop Idol runner-up Gareth Gates plays the title role and acquits himself surprisingly well considering he is outside of his comfort zone. The complicated part-writing in 'Wishing for the Normal' (in which he's joined by the excellent Leanne Jones) seems to cause him no problem at all, while he brings pathos to both 'They Don't Make Glass Slippers' and 'Gypsies of the Ether', the latter a duet with Oliver Tompsett (well contrasted in terms of vocal timbre). The Latin-tinted 'It's Hard to Tell' is a catchy production number that is just slightly marred for me by one or two banal lines in the lyrics, a complaint one could more severely weigh against both the words and music of the ugly sisters' 'I'm So Over Men' (characterfully performed by Joanna Riding and Claire Moore, it has to be said). 'You Shall Go to the Ball' is a rousing ensemble piece that brings together the whole cast of the evening, and they all pull together well. With a bit more refinement and the tightness brought to shows during previews, the musical has huge potential. The disc ends with a sweet rendition of 'Does the Moment Ever Come?' from Just So by the composer and lyricist. Overall, the disc is enjoyable and entertaining, with some weaker numbers and the inevitable flaws of a live recording being the only undermining factors in an otherwise attractive package.